Elderly man in wheelchair killed after being run down by Hummer at Tel Aviv crosswalk. 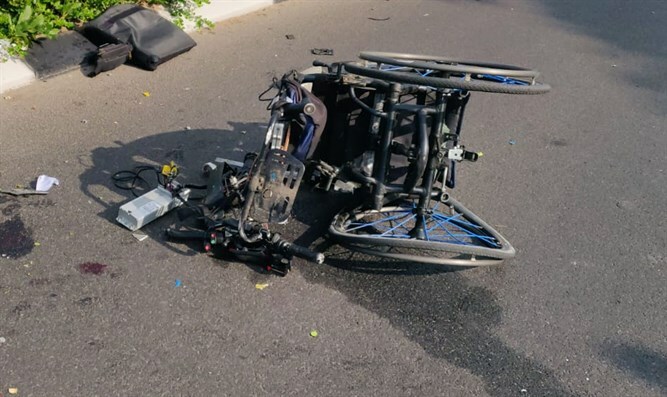 An elderly man in a wheelchair was killed in north Tel Aviv Wednesday morning when he was struck by a private vehicle while crossing the street. The incident occurred on Einstein Street, near the intersection with Levi Eskhol Boulevard in northern Tel Aviv at 8:15 a.m. Wednesday, as the roughly 70-year-old man was crossing at a crosswalk, police said. While he was crossing the street, the elderly man was hit by a Hummer sports utility vehicle which was driven by a 59-year-old man. According to first responders, the Hummer struck with such force that on impact the wheelchair was smashed into pieces, which were sent flying dozens of yards in different directions. Emergency medical teams from MDA were dispatched to the scene after an emergency call was placed at 8:16 to the MDA’s Dan region call center. MDA paramedics quickly arrived at the scene and treated the victim before evacuating him to Ichilov Medical Center in Tel Aviv. Initially listed in critical condition, the victim was declared dead after arriving at Ichilov. “I was driving back from the hospital when I received a call about a traffic accident on a nearby street,” said MDA first responder Oded Gal. “Pieces of the wheelchair, which had been completely torn apart, were strewn all over the road, across a radius spanning dozens of meters. Next to a vehicle there was a man, roughly 70 years of age, lying down unconscious, with extremely serious multi-system injuries.